The Pure Thai Shophouse storefront. I have to confess a good deal of the subtlety and nuance of Thai food is usually lost on me. Generally, my previous experience is that Thai food is often consistently peanut flavored. That’s testimony to my inexperience in this culinary tradition, but it’s what I’ve found thus far. Hello Pure Thai Noodles! This time tipped off by Grubstreet (via Midtown Lunch), I decided that despite noodles being made of the dread white flour, nemesis to all diets, it was time to give it a run. Boy, that looks good, doesn't it... . I ordered the Ratchaburi crab & pork dry noodle. 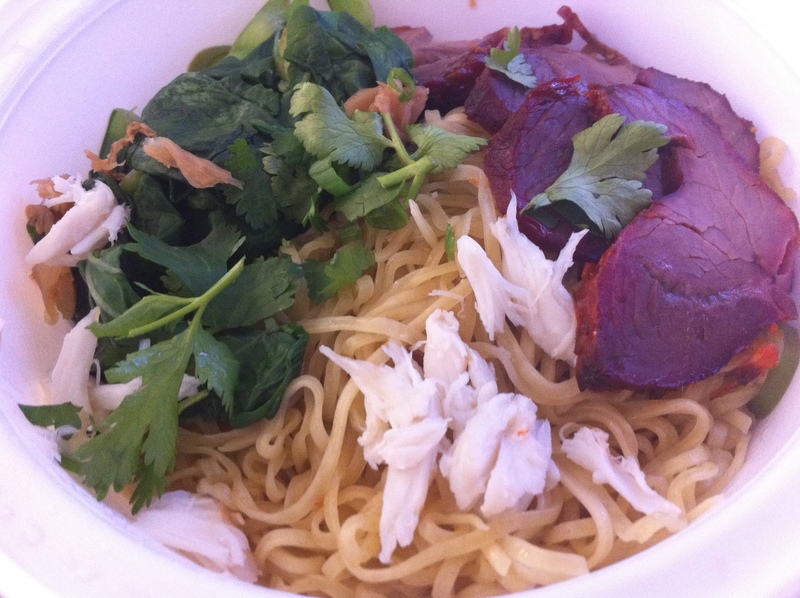 It’s handmade egg noodles, roasted pork, lump crab meat, yu choy and scallion. Yu choy is a leafy green stalk. The meal – clocking in at $7.62 – was delicious. The homemade egg noodles are very rich and sweet. The roasted pork was smoky and hearty. I realize it looks a bit purple in the picture, but it was beautiful. Pouring a bit of the pickled jalapeno(?) added a sour note to the whole thing. All in all, if I’m honest, I’m not really sure what was happening in my mouth. But it was awesome. Definitely going to return. Delicious!